I didn’t know what parsnips tasted like until I was served them at Chez Panisse (though I have a feeling those exquisite thin strips of crispy, sweet, salty delight were the heavenly version of parsnip that would be hard to replicate by a mere mortal like me). The dish was so good I wanted to try cooking parsnips myself but when I got to the store I had no idea what they looked like. I was searching for something like a turnip or rutabaga). The green grocer showed me the parsnips and told me they were in the carrot family. He also warned me that they stink badly when you first start cooking them but that the smell goes away after about 15 minutes. My parsnips have been sketched, but they’re still waiting for me to figure out how to cook them, alongside a bunch of beets, the last veges left in the fridge. It’s time to get cooking and then get shopping! And of course I had to look up the etymology of parsnip, rutabaga and turnips. 16c., parsnepe, corruption (by influence of M.E. nepe “turnip”) of M.E. passenep (late 14c. ), from O.Fr. pasnaie, from L. pastinaca “parsnip, carrot,” from pastinum “two-pronged fork” (related to pastinare “to dig up the ground”) so called from the shape of the root. The parsnip was considered a kind of turnip. 1799, from Swed. dial. (W. Götland) rotabagge, from rot “root” + bagge “bag.” Slang meaning “dollar” is from 1940s. 1533, turnepe, probably from turn (from its shape, as though turned on a lathe) + M.E. nepe “turnip,” from O.E. næp, from L. napus “turnip.” The modern form of the word emerged late 18c. You can have a lot of fun with words. Some words in South Pacific languages really sound like swear words if you are English speaking. And here’s one – Dracula – I had blood tests today and thought the door to pathology should be called Dracula. Dra’ in Fijian is ‘blood’ and ‘cula’ is needle’, so that does fit doesn’t it! I would do the beets in the same way but separately. I don’t think those two tastes go together. Good luck and great sketch of the unsung hero of the veggie world! My husband does the cooking around here, and he uses all sorts of root veggies, including parsnips. From the odd looks he gets from checkout people at the store, it’s clear that not many people eat these tasty vegetables. Fun post! I’ve seen parsnips but never actually purchased any. Let me know how it goes, I may have to try it! Wonderful sketch! Love your sketch! The only time I’ve had parsnips were mashed like potatoes……but in Texas I was raised on turnips, similar taste. Never had them prepared as you described though…I think cardboard would taste good that way!!! I have painted rutabagas although I’ve never eaten them…. I don’t cook parsnips often, and really only use them when I am making beef vegetable soup as i too am at a loss of how else to cook them. I cut them in half lengthwise, and then each half into thirds, lengthwise. I put them into the soup at the same time I add carrots. They give a wonderful depth to the soup flavor. To me, they have a fennel-like flavor. I love them, and think I might try roasting them as Libby above suggests. Aah – weren’t they delicious? I’ve been considering buying a deep fryer ever since we had them. I’ve always roasted parsnips cut up into strips with some oil and salt in the oven. I love the design of your page, and that beautiful purple. Try a standard pureed vegetable soup made with one onion, two carrots, two parsnips,one largish potato, butter, salt and pepper, stock and about a desertspoonful of mild curry paste. Gorgeous! 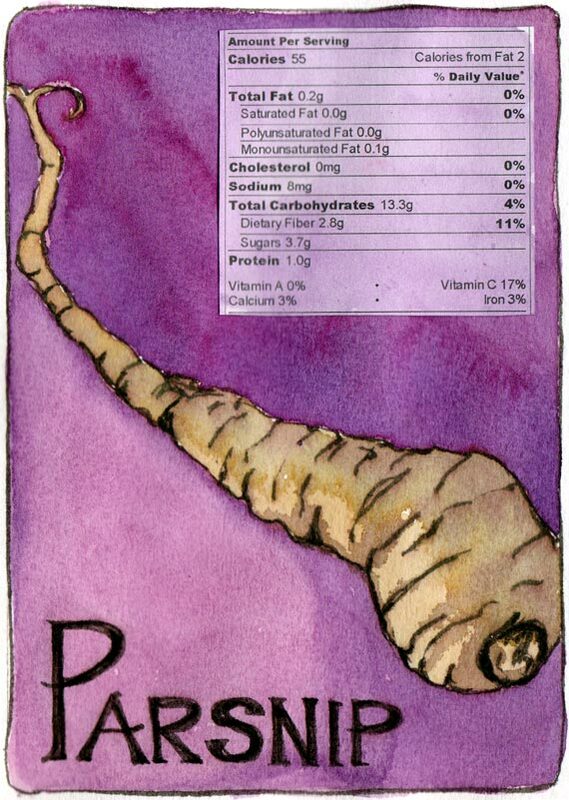 Incidentally, sorry to lower the tone, but in some areas at least of the UK “purple parsnip” is slang for part of the male body. No prizes for guessing what. I boil cut up parsnips in milk, mash them with butter salt and pepper and add a tblsp or two of horseradish. Addicting! Love your blog and art….